The Ritz-Carlton Golf Club sort of broke my heart this year...played this course about 3 years ago and it was hands down the best course I ever played. Saved this course for our group finally, and my entire group concurred that the other 3 courses we played before this one was much better. The Ritz is still better than most, but just wasn't up to par on this day. Play here every year and the conditions and service are what make us come back. The bunkers weren't in the best of shape- not a lot of sand in them, but the incredibly fast greens made up for it. We were disappointed with this course. All the hype about the PGA Father Son tourney being played there. Very woodsy and difficult for the average over 15 handicap player. Not sure if we would go back to this course. Beautiful golf course, excellent maintenance, the path is immersed in a wild, very challenging, inserted within a beautiful Resort. Will come back. Excellent track that is well run. The staff was exceptional and the course fun to play. Outstanding course in beautiful setting. Wish I played better on back side. Great clubhouse. Accommodating staff. Another must play for our group. Really enjoyed it! Very slow play.Course was in ok shape. Good value. As always the course was in exceptional condition and would recommend this course always. Course overall was in very good shape. Still a lot of dormant areas which I was surprised to see. Greens were excellent but a little crusty. First time playing here. Nice facility. Course is fair to all players. Club house restaurant was great. Course was in good condition, but set up to go out seemed very confusing. A wonderful and enjoyable golf course, condition and facilities 5 star would recommend you play it. Challenging but fair. Best course in the area. Awesome condition - clubhouse staff (Steve) really took care of us. Scheduled to play 36, 2nd round got rained out. Set us up for another day w/out hesitation. Highly recommend. Course layout was challenging enough for sure, but it's fair. Good test for anyone. When the pga has a father/son tournament here, you know it's a must play. Very good golf course. Found that you had to think about where your teeth shot needs to land. A very fair course for all golfers! Fantastic golfing experience! From arrival to departure we were looked after by friendly staff, both the clubhouse and course were first class. We have played this course on numerous occasions and it is fabulous. Practice facilities are second to none with great staff. Course lovely with water coming into play on some holes. Condition great. We enjoyed chicken wings, and blue cheese dip with carrots and celery following our game. Delicious! Great course in very fine condition, quite slow but worth hangin in there. Will definately be back next year. Nice course overall, greens were ridiculously fast and hard. We were told there was a US open qualifier there the day before. Entire resort, food were very nice and good. Would recommend. One word spectacular! Staff went above and beyond to make us feel welcome. Will play anytime I can and it is a must to play. Great course in fabulous condition. Typical FL course with lots of sand and water but one of the best conditioned courses we played. Great value from Tee Times USA. Course was in good shape and layout is nice, but greens were a little too fast for players coming down from the north in the middle of the winter. Starter was a bit ambitious telling us we needed to finish in 4:05, but they didn't bother us when we finished in 4:45. Outstanding. Like playing in a Botanic Garden. One of the best courses I have ever seen. One of the Best you can play anywhere-Great practice facility to go with a 5Star Course. Course was nice and so were the fast greens. Probably the toughest course we played all week, but well worth the challenge. We considered playing a second round but the course had a tournament scheduled for the afternoon. Course in great shape, staff very friendly excellent visit will come again,always a pleasure to play your great course. The greens here are extremely fast but also extremely true....and in great shape! Actually the whole course was in great shape and is definitely one of the best courses in Orlando. Nice course and well maintained. As always the creme de la creme!! This is the staple of our trip. Play every year, a must play for any trip. Superb track!! Great course. Staff was friendly and made it a great day.I would play this course on a return trip. You have to play this beautiful golf course. Staff and practice facilty were top shelf!! We were treated like royality. Thanks Teetimeusa for making this day possible. Outstanding ,we will be playing it again next year. Greg Norman did a wonderful job! Great layout and beautiful greens. A very enjoyable experience on our last day of the trip. Beautiful course but I should have practiced putting on the hood of my car! Very fast greens - good test of golf. Best course we played all week. Well kept - high quality. Layout was great...no homes lining the fairways. Definitly one we will play again and worth the money. The reception staff was great - very nice pro shop - the course was in great shape and well maintained. The wait staff in the restaurant was unbelievably friendly and made our day complete. Greens were perfect [fast but true]. Layout was fair. Blue tees [6 - 300] not a problem for mid-handicappers. Not worth asking price but reasonable with TeeTimes package price. Nice course. Great condition. Excellent greens. Wonderful playing pace. Great staff. All in all - first rate. Great service from everyone at the club. Very good practice facililities. Great course layout and the course was in good condition.Recommended. Very nice course - short and playable. Lovely course. Wide fairways and multiple tees give appeal for a wide range of handicaps. The greens/slope around the green are challenging. Absolute gem. Great service and world class golf course. This was our final round of 4 days of golf and perfect place to wrap it up. Great conditions and very nice greens - quick. Nice course - well kept. Staff here was top notch. The course was outstanding and the service was wonderful. The little touches - engraved bag tags - free practice balls and truffles brought to us on the course was the icing on the cake. Exceptional golf course - exceptional staff - fantastic. This is my favority course in Orlando. It was in fantastic condition and I love that you can walk. Caddie program is first rate. The absolute best! Phenomenal course conditions and layout. Staff couldn't do enough for our group of 28. A must return. All I can say is 'WOW'. This was the first time playing this course and it was awesome. The people there treated you like Kings. Thanks to Shannon - she made it affordable to play this course. What can one say about this course other than to say it is the best. The service - condition and value are second to non. Will certainly play this again. Was looking forward to this course the most - and itwas nice. Staff was very cordial. Course was in great shape! I had a great time - the course was in great shape.I've played it twice and loved it both times. The best course we've played this year! Wonderful andhelpful staff. Excellent all around practice area. Excellent allaround. five star! Top shelf service and conditions. The staff and courseare just outstanding. Beautiful course - challenging but fair - exceptionalservice and surprises from staff during round. Nice layout - first class treatment - best greens wehave played in 21 years of golf trips to Orlando - Myrtle Beach - Hilton Head - and Pga Village. Difficult but so nice especially when playing withthe hotels in view. Very well maintained. What a deal with theDisney special! Beautiful course with very hard - very fast greensand great people. Love to play it again. Outstanding course - a little advertised gem! The course is in excellent condition. Fastest greens on our trip. Great layout. Many challenging holes. Many in our group want to play the course again. Great course treated like royalty they know how totreat their golfers. We are definately going back there nextyear. What a treat! The staff was great and the golf coursewas in great shape. A must play on return next year. This was my favorite course. You can tell thedifference from all the other courses. Super fast greens and inperfect condition. Friendly staff and good service. All thetrouble is reachable from all sets of tees. Beautiful course thatyou just have to play. One of the best I`ve ever played. Top conditions - perfect greens - and good service. Was my second time there - notthe last one. Perhaps the best course our group has played in thelast 20 years. Enjoyed this course!! First time playing it and it isalready on the schedule for next year's trip. Really loved the course. Each hole was very secludedand private. Did not need to wait to tee-off for any of theholes. Pace of play was well adhered to. Excellent course. Will try to play again next year. Very nice course that was in excellent condition. Thestaff was very friendly and courteous. Absolutely great - we were there a week before thefather and son tournament - best greens of all the florida courseswe have ever played. We will definitely pick that one again. Very nice condition. To be replayed. Course was beautiful and in great shape. Course was in tip-top shape with Father-Son eventjust ahead... by FAR the best greens we played on the trip - theywere perfect - stimping 13 and nary a blemish... enjoyed all ofit - especially the first 14 holes-- then it kind of came out intothe open. One of the best courses I have ever played it was insuperb condition and the staff could not have been more helpful - a definate course to play again. Stunning Golf Course - would definately play again. Great staff equals excellent golf course from start to finish.Have enjoyed every moment on this well manicured fairways and impeccable greens. The course was in great shape. The fairways were very friedly and the greens were spectacular. Had a great time. GREAT RESORT STYLE COURSE. MAINTAINED BEAUTIFULLY. GREAT STAFF WHO WORKED VERY HARD TO ACCOMODATE OUR REQUEST. WE HAD A GROUP OF 9 GOLFERS FROM TORONTO - CANADA. 4.5 star course...everything was perfect fairways and greens were immaculate....would play there every year!!!!! Top course and top service. Friendly staff. Very Nice Course. Club house and staff very professional and treat you well. A wonderful facility - great service and great layout in superb condition...it's on the list for next year already! Beautiful course. Staff very friendly. Course is ingreat condition and fair for all golfers. Comparable to Disneycourses and not as busy. Great conditions and helpful staff. Plenty of challenges without being unreasonable. Great service from the staff. I will definitely play this course again. Loved golf course! It was in great condition and thegreens where excellent. Beautiful course. Upscale pro-shop and facilities. Great stop. We really loved this course. The people were veryfriendly. We will in back in the spring. Exclusive golf course with a great team. Classy place. They treat you like Vip's. Widest fairways I have ever seen. Really enjoyed playing there. Hope to come back soon. Manicured course and grounds. Fabulous course and facilities. Best Greg Norman course I've played. Very walkable. Super caddie program. Pristine conditions. This is a winner! Course in outstatnding condition. Every aspect of club and course meets expectation for a nicklaus designed course. Another great course. Good shape nice staff and clubhouse. The welcome was consistent with good service. They were ready for our group of 12 and got us started as soon as they could. The course was in very good shape and pace of play was right on schedule. The new course is a style that we don't play much but was enjoyable. One in our group made a hole in one on the second par 3 on the front. Very nice course but somewhat confusing for the groups b/c of the double greens. A few groups in front and behind us played the wrong greens. This was our first visit to The New Course at Grand Cypress and it's safe to say we'll be back. I appreciate links style golf and this course did not disappoint. There is a lot of variety and undulation in fairways, and well placed bunkers, some of which are deep enough to require steps in order to get down into them. Most green are 'double greens' meaning they are quite large offering multiple pin placements. Greens were in great shape and rolled well. Played the New Course - Wide open fairways replicating St Andrews. Great shape. Staff were excellent. Come early and use the driving range. Restaurant is good with reasonable prices. Excellent course, very beautiful layout. We will be back next year. I've played at this course 3 times. This is probably the best condition I've seen it in. We played the New course (which is something you should play, unlike anything else in Florida) and the East and North other courses of the 45 holes they have here. The conditioning of all of their courses are very good. Great golf and fun. We even got to see Keegan Bradley on the East 9. I think a lot of pros/wanna be pros play and practice here. Also good for a lineup of courses in Orlando. Would go back again for sure. Course is in great shape, but would need more indications for visitors. Many time we had to guess where to hit. Great course and facilities. The staff was friendly and helpful. The course was in great shape and challenging. The replay was great bonus as we were able to go out and play the other course while we were there. Would play again. Course is always in great condition. A fun course to play. It's a nice warm up course with wide-open fairways but lightning speed greens. Fun links design, but too green to play firm and fast. Great time! Love the New Course. Very challenging. In fabulous shape. This was a beautiful, but tough course. It was tough because of having shared greens. Throughout the round, individuals hitting to their green would hit into us because we were already on our green. Also, because it was the first time playing this course, we were confused about which green to aim for while in the fairway. While I liked the course overall, I did not like this aspect. It caused me to feel a bit unbalanced and thus had a higher score than usual. Very interesting course, would like to play again knowing what i know now. Played the New Course. Some guys hated it, and were demoralized by the pot bunkers. Somewhat of a shooting gallery on the back nine with regards to playing into other groups. However, I enjoyed it, since I played well. Played the new course...St Andrews replica. Really fast greens but enjoyed the play. Very good quality greens and fairways and good customer service. Having played the East-North-South earlier in the week we saved the best for last. Always in immaculate condition. A bit pricey but worth every penny. Was in great shape, smooth and consistent greens, courteous and friendly staff, well stocked Pro Shop. The course is always in great condition. Friendly and helpful staff. Great variety of holes. If you are looking a links course this is a must play!! It was a pity we could not play this court because of Irma. We really want go again and have the pleassure to play. This is the second time I have come to Orlando and played Grand Cypress New and just love this course, the course was in great shape and the staff is top notch. Course in great shape with a very good staff. Course in great condition, excellent service. Top rate course. GPS would have been nice. Staff was friendly. Greens were hard and fast. Will play here again. Make sure you are below the hole. fairways are huge. Old course at St Andrews. It was our 3rd season @Grand Cypress, and the course was in great shape. We'll be back next year! Course is always in great shape, pace of play was good, 3rd time playing this course will be back again. Course in great shape as always. 3rd time playing in 3 years on golf trip. Staff was GREAT !!! Mike in pro shop helped us on tee times with south/east course also. Pace of play, good, greens fast, tees ,fairways great condition. Cant go wrong with Grand Cypress!! Always in great condition. Fun course to play. The crown jewel of our trip!!! In great shape - played very tough. First time playing and pleasantly surprised. Nice course and bag drop has valet parking, club house excellent must play. Fun course to play, however sometimes quite close to the others. Easy fairways with wide landing areas, but very difficult on big greens. Overall challenging course, something different. Fun course. In great condition with very friendly staff. Wide open fairways but lots of bunkers. We played this course last year and everybody enjoyed playing it again. Course was in perfect shape. Playing from the correct tees course is fair. Greens fast and tricky. Very nice resort and golf courses. I would come back to play the courses that I did not play this on trip. Also, I would consider investing in a stay and play package. First time playing the course. Loved the layout. Played two rounds for one great price with Tee Times USA package. This is a nice course and it is great to play a links style course after playing the resort courses. We teed off the 1st and unfortunately caught the field on the 10th - there were about four groups and they were incredibly slow. We went and played the front nine again. Luckily we had played the course before. It would have been better for the starter to send us off the tenth - we were only a two. Fantastic course!! It was in great shape in spite of the heavy rain fall the previous couple of days. Great staff!! We will be back next year. Fantastic course..sneaky difficult, since everything is right in front of you. It gives you a feel of playing over seas. A must play. First time playing it and liked the course. They have definitely managed to get many holes in the St Andrews Old course feel including the turf some how! I would recommend! Fabulous! Course in great condition and staff friendly and helpful.Water comes into play on a few holes. Plenty of room on fairways on all holes. Would definitely recommend this course. Another must play couple os courses. Played the New in the morning and that was brilliant and played South and East in the pm, not qiute as good, but well worth the play. Magnificent course.Generous landing areas from the tee. Smooth greens that roll true.Very well maintained. A must play if you are in Orlando. Will play twice next visit. Truly spectacular. Very beautiful course. Well maintained and a good challenge. Course in perfect condition. Staff was great. Great way to start our golf trip. First time at Grand Cypress, Was fortunate to play the New course and N\S. Both in absolutely amazing condition and was the highlight of the holiday. Actually thought I was on the practice putting green rather than the first tee of the new course, its that good. Great course, would definitely go back again. Grand Cypress New Course is Orlando's best golf course. We played 2 years in a row here, we'll sure be back. Beautiful, well maintained, course, very friendly and helpful people. I would play there again. Great course layout and in very good condition. Excellent pace of play! More bunkers than I've ever seen, but wide open and a lot of fun. I would play this course again. Really fun - and 'big' golf course to play. Many of the holes are replicas of some famous British Open holes.It was very unique - and a nice variety of easy - and really tough holes! Definitely a must for Orlando golf trip. Always a challenge but delightful. Really a nice course,first time playing, great layout, 4hrs. Great Track in great condition, can't wait until next year when we try some on they other course at this site. Beautiful wide open course. A couple holes were not marked very well and with it being wide open we weren't sure where we were hitting to. We ranked this #1 of the 5 courses we played. Layout was good. greens were in good condition and just speedy enough for us. Another top notch facility. We played the New Course. Challenging greens on an otherwise benign layout. Conditions were good for March. 2nd best of all the places we played. My son and I enjoyed this course very must. You must play here when in Florida. Again, people were unbelievably accommodating and the links layout was a treat to play. I look forward to returning to Grand Cypress in the future. Nichlaus' homage to the Old course in St. Andrews is a very nice track. What a great course and the staff is always awesome. This is what you expect from a place like the caliber of Grand Cypress. We play the New Course every year when we travel. I still remember the first time we played asking the starter on the first tee, 'where is the rough?' He said 'there isn't any. Just 182 sand traps, gorse and burns.' This tribute to St. Andrews is awesome, as close to a true links course as you will find in Orlando. I highly recommend playing the New Course. Great course, great welcome and well worth a visit. Putting is the key to enjoying your round. Great course. Tee time delayed 40 minutes due to preceding shotgun scramble. Played in 4 hours 20 minutes. Really nice course layout and greens rolled true. We played the 'New Course' at Grand Cypress. It was awesome! It probably helped that I played well, but the greens were in great shape and definitely a change from the typical FL courses. The shared greens were unique, and a pretty cool experience. The Grand Cypress resort had all of the amenities and was very well organized. I would play here again despite all of the other options that are also out there. Very enjoyable and well kept. Played the New Course. Could have done with a course guide or some form of layout assistance. Loved the new course at Grand Cypress which is now right up there with all the other top courses we love. I loved this course! One of my favorites. Special course, with wide fairways. Fun to play and condition of the course was great. Nice layout and the service was excellent! The course was in great shape, its very forgiving course suitable for golfers of all abilities. The day I played it was busy, however I still managed to play within 4hrs 15mins. Next trip I would like to play the other courses at this facility. Coolest course I have ever played. Very hard to go out of bounds, almost no rough in sight. Multiple routes could be taken to get to the hole. Lots and lots of bunkers. Greens were perfect, fairways were mint and tee boxes were flawless. Not your typical American golf course. Good welcome. Because it's Jack Nicklaus' homage to St Andrews Old Course a lot of the fairways are wide open but you can easily be caught out by the pot bunkers. Use the practice putting green before playing as the greens are undulating. Regular on-course refreshment service with water/ice top-up point at regular intervals. Good bar available in the clubhouse. Would play again. Played new course completly different to the north south east courses,plenty of room to get the driver out on new course. All courses are well manicured greens quick, north south east courses greens are more undulating. Very fun course, mostly wide open off the tee with some difficult greens and approach shots. Our group of 8 had scores ranging from 69-100 from the blue tees and everyone enjoyed it. Greens were in very good shape. Would play again for sure. Fun course, easy and really well maintained. Great staff. Returned this year and enjoyed the course as before. Course in good shape. Overall staff excellent. Great course excellent service, greens fast, would play again. The service from Tee times USA was also excellent. Great course and in very good condition. Staff was very friendly and helpful. Six of the group played an extra nine at no charge and the pro shop set it up with no problems. Absolute beautiful golf course. Bag Drop, Pro Shop and Starter were very attentive and did a great job getting us out on the golf course. A very unique layout for Florida. Buy a yardage book. Consider this a must play. Great course and club amenities. Very nice course! This was our first course and a great way to start a golf vacation. Very generous fairways but a nice challenge around the greens. We loved the frequent ice and water stations as it was a nice warm day. Practice range was nice considering we hadn't played in months! Staff was courteous and helpful. Awesome course, will definitely play it again next year. Loved it!.. Great way to start a golf vacation. Wide open, Nice layout. Played the blended tees. Great conditions for the time of year. Will definitely include in next year's itinerary. VERY INTERESTING COURSE. EACH HOLE PRESENTED A DIFFERENT CHALLENGE. Best course we played on the trip. Will be back. Fun courses, great condition, excellent staff! We played new course - awesome place to just bomb away - and east/south - tighter and made you think you're way around. Overall a great experience and we will be back for sure. Best Course I played in Orlando! This place is a must play. Will play again if given the opportunity to play again in Orlando. 12 Handicap. A must play in a trip to Orlando ! Wonderful course. One of the best in the area. We played the New Course which was fun but very wide open. A great course to play when it's your first round of your vacation because you can get up and rip it on most holes. The condition of the course was awesome, the greens very large and true. Best we played on the trip, liked the links style and the greens were the fastest we saw all week. This is our second time at this course. Everything about it is great. Nice layout, good condition and excellent service. The Grand Cypress New Course was in great shape and the staff were very efficient and welcoming. Excellent course to start on. All six of the Group would play again and enjoyed our experience on the new course. Great course and facility. Would have helped to have local knowledge for tee box sight lines but a must play!!! Beautiful golf course. It definitely has a Saint Andrews feel to it and was in great shape. The staff were all very kind and made the day a total enjoyment. I will play here again for sure. It' s a wonderful course. I recommend this course. Great course! Open - well-manicured - great staff. Perfect tribute to St. Andrews. We played ChampionsGate - Falcons Fire - and Orange County as well. This was the best! Love the course. Lots of fairway bunkers to find from the tees. I know because I found most of them. Big greens - wide farways make for enjoyable round. Outstanding. This course lives up to the billing of being a true British Links course. Thoroughly enjoyed it and I will certainly return on my next trip to Orlando. we loved the New Course at Grand Cypress - and actually replayed Grand Cypress [East and North Courses] in the afternoon. Group loved it - new favourite course in Orlando. Such a different game required and every shot needed to be thought out - a real treat. Will need to practice 30 yard wedges off firm turf over bunkers and burns to improve next time. Very interesting links course. In very good condition. Pro shop and golf course personnel very hospitable. Will play again. Loved it. This complex is the BEST! First time onthe NEW course and we were not disappointed. Staff treated usfirst class like a private club. We will play all our roundshere in the future. Loved it. This complex is the BEST! First time on the new course and we we not disappointed. Staff treated us first class like at a private club. We will play all our rounds here in the future. Great service. Course was in great shape. We will definitely go back. We will also look at playing 18 of the other holes. Outstanding course great fun to play. The widefairways sure made challenging by the abundant bunkers andundulating greens. A great tribute to Links style golf. Wide open - butplenty of issues to contend with. In really good condition - acredit to Grand Cypress. Fantastic course in great shape. Links style with few trees - wide open fairways and lots of fairway bunkers. Did I say lots of bunkers - there''s gotta be over 1000 - really. Nice greens. Wonderful overall experience! The new course and the three loupes of nine - North - South and East all presented different challenges to your golfgame. I would recommend taking the time to have a full days golfhere to enjoy all the varied golf holes presented by thismixture. Played the New Course twice and enjoyed both rounds very much. Exceptional layout and attentive staff. Will plan to return. The very best. the highlight of our trip. Can't wait to go back!! It was very windy this day - excellent links golf! First time we have played this course and were impressed with layout and standard. Good welcome and while speed of play was a little slow did not detract from experience. Grand cypress is a great property. Have played thelink course before. It is a fun course and I would play again. Wonderful golf course in great condition. You can picture the layout being in Scotland - except for the heat and softer conditions. Plays much longer than the yardage - so don't immediately go to the back tees! Very different course to the others we played duringour time. Great course - very enjoyable and challenging. staffwere helpful throughout our round. Great course - felt like Scotland without the coldweather. The New course is in fantastic shape. Very impressiveresort and staff. Will definitely be revisiting on our next trip.North and South courses were excellent as well. A very enjoyableday! Good course. Played on the suggestion of TeeTimesUSA. Fantastic golf course. We played the 'New' coursewhich was in great condition. We were well looked after on andoff the course making the experience memorable. Enjoyed the course and playing conditions were great. Superb course and clubhouse. Nice Scottish design withexcellent conditions. Best of the week. Course was the NEW course at Grand Cypress and wasspectacular. As always teetimesusa was flawless. Wow! What a course! Great conditions and a back to thefuture experience. Must play! Different than anything else you will play in Orlando - old Scottish style Lynx. Will play again. Course was in great shape. Nice greens. Definitely play again. Fun course to play and it's in good shape. The staff could not be more accommodating and we'll plan to be back next year. Very nice course with links style layout. Was wellmanicured and had fast greens. Great course and price. Beautifully maintained. Excellent experience. Third year we have played thiscourse and love it every time. Great service and wonderful course. Excellentconditions. Definitely a place to play every chance you get. Courses were excellent. Greens were fast and true.Staff was wonderful and accommodating. We will be back again.Would recommend the golf courses as well as the accommodations.Thanks. Fun Course if you like old school golf. Doublefairways and greens galore. The Grand Cypress is still the nicest course I haveever played. The course was in great condition just as it was thelast time I played it 10 years ago. Absolute must! Put in on your list! New course was overbooked and very slow. we replayedon North and South - WOW. want to play these again! Course was in great condition as always and lots offun to play...greens were perfect. Very fun course to play. It is definitely worth it.Open and fair...very good greens. Day 2 played the old course very much like St.Andrews very wide open and lots of double greens - wonderful clubhouse lots of memorabilia. To cap the day off they let usplay 9 holes on the south course free. Simply the best. Course conditions and staff were great. Played alot of links courses in Scotland but to findone in Orlando was surprise it was superb layout. I liked beingin Scotland but here the weather is better and the staff sofriendly. Everyone in our group of 14 enjoyed this course immensely. The course with it's pot bunkers offered a challenge unlike most of the courses we usually play. This course is a go back to for future trips. 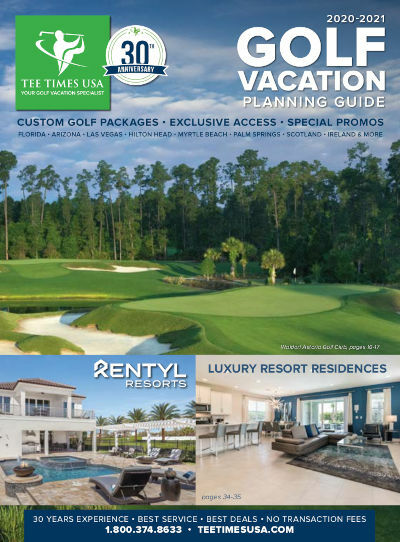 Three nights accommodations at Tuscana Resort, ChampionsGate in a three bedroom villa, based on quad occupancy. One morning round on Shingle Creek with power cart. One morning round on Ritz-Carlton with power cart. One morning round on Grand Cypress New course with power cart. * This $377, 3 night / 3 round package special is based on a trip April 29 - May 2, 2019. The 3rd night free special must be booked by 2/28/19. * 3 nights accommodations at the Tuscana Resort, ChampionsGate in a 3 Bedroom / 2 Bath Villa with four beds and a pull-out couch, based on quad occupancy. A departure fee of $45+tax for a 3 bedroom will be added to your reservation.